So I mentioned in this post about my love of all things wicker-y and basket-y. I'll show you all my secret shame soon. First I want to share with you something which is nothing short of miraculous! At least for us! It's the middle white box. What, it's just a white wicker basket?! How wrong you are! Inside this lovely basket is my highly technical and complex method of organising. This is how all our wires were previously "organised". The worst part is that these are only half of them, I also had a drawer full. So after many attempts I have come up with a ground breaking method to sort your wires. Okay, so maybe it's not massively ground breaking, but it really does feel like it for me! There's even space for the screen cleaner and no longer have any wires in a drawer. Which is a good job really, as this new bookcase has taken the space of the table with that drawer. 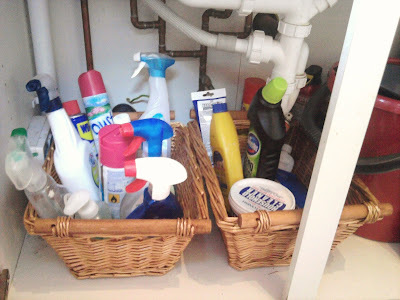 Speaking of, here's some of the excuses to buy uses for wicker baskets I have in my home. In a wardrobe as storage for shoes and scarves/belts. In a bedroom for pajamas/jeans for the next day. In a child's wardrobe as storage for lesser used toys. Also the box on the left has bed linen. If I had another wicker basket it would go here and make the sheets even prettier. Inside a drawer to keep smaller, similar toys together. This is a slightly older photo, but the box on the left is similarly organised to the wires box with bags, but for jigsaws. It makes putting them back SO much easier. Plus I don't have twenty or so broken boxes to store. And lastly I have two under my sink. Not really any particular reason. They make me happy, and maybe make it seem like there's less clutter/spray bottles with only an inch left of cleaner. Ha! I love storage containers too! I'm not just confined to wicker though...I love them all, fabric, plastic, baskets, canvas, even cardboard, I just love storage thingies! :) My husband thinks I have a strange addiction. Super great solution for the cords! We do the exact same thing with all of our puzzles, works so well! Thanks so much for linking up to Blissful and Domestic Sunday Blog Hop. Hope to see you back tonight. New GFC follower from the Sunday Blog Hop! I'd love a follow back. Brilliant idea for your cords! I have cords in drawers and several shoeboxes. Love the baggie idea! Thanks for sharing. Agreed, love the baggie idea! 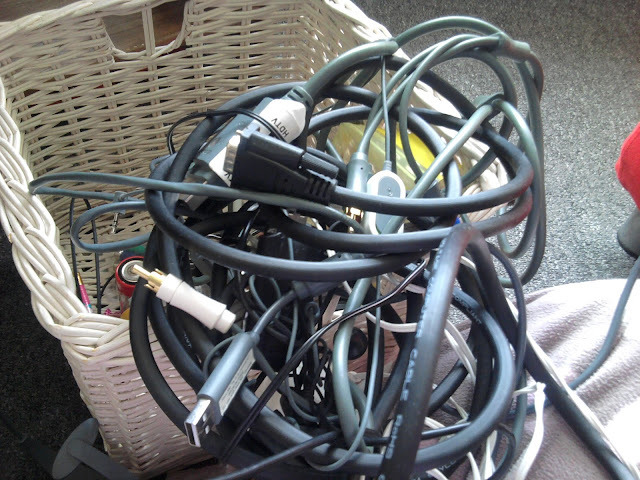 Does anyone have ideas for how to organise cords in used under a desk though? Sorry can't figure out how to post except as a reply! I'm not lucky enough to have a desk! But one idea I've seen is to use bread tags (the plastic ones) and clip them on the wires to label them. You can also get really cheap wire tidies in DIY shops. They group them all together like one wire so it only looks like one going down the back. Also you can buy a length on foam tubing and cut it down one side, slip your wires in and have that going down the back? Then you can trim it to any length!